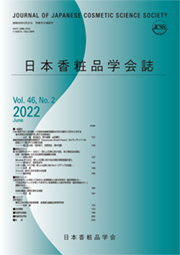 Key words: Japanese Cosmetic Science Society, history, future cosmetic, purpose of the 40th meeting. Key words: historical change, sefety evaluation, health damage, drug metabolism, alternative testing method. Key words: dry skin, sunscreen, whitening, sensitive skin, QOL. Key words: risk communication, risk/benefit, risk management, shared decision making, user testing.